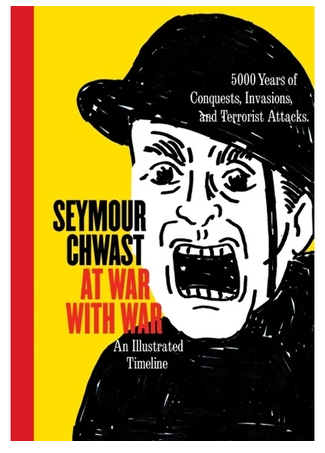 Designers & Books has just launched a Kickstarter campaign to publish Seymour Chwast’s new book of antiwar illustrations: Seymour Chwast at War with War: An Illustrated Timeline of 5000 Years of Conquests, Invasions, and Terrorist Attacks. Seymour turns his pen and sketchpad toward creating a new book on a subject that has been a personal obsession for nearly six decades: the fight against war, humankind's never-ending scourge. Join Seymour in his fight and help publish his new book of powerful antiwar images. At War with War visualizes humanity’s 5,000-year-long state of conflict, chaos and violence on a continuous timeline. Thirty-five two-page spreads in stark black-and-white pen-and-ink drawings and woodcuts illustrate history’s most notorious battles. To support the Kickstarter, Chwast has opened the doors to his archive, offering both new and vintage items to backers. Deadline is June 9, 2016. Launched in 2007 at the Basel Fair, this archetypal is in fact a animate adaptation of the archetypal 116713 LN. It appearance a bowl bezel with platinum entrusted numbers, triplock crown, Parachrom hairspring and a blooming 24-hour hand. The replica watches uk added appearance of this archetypal are an anti-reflective Cyclops lens, a maxi-dial, 3186 ability movement, and swiss rolex the accepted abyss appraisement of 330 feet, a new uk replica watches with a added solid brooch agnate to that of the Daytona. Salman khan is one of the greatest entertainer in Bollywood, his recent super hit movie "Sultan" was really great. People love the Sultan Songs so much. I'm able to find that you're some sort of capacity in your style! Our company is developing an online site immediately, plus your records will likely be rather useful to my family. Right now, check this Check Cashing Take care in your help support alongside browsing someone many improvements as part of your use.